MIX AND MATCH COLORS - Don't get stuck having to order the same color twice. We have a large variety of colors to mix and match so you don't have to get the same strap twice if you don't want it. All our Hnybaby products come with a 100% satisfaction guarantee. We are so confident that you will love these products and will do whatever it takes to ensure your satisfaction. Customer service is our number 1 priority and we aim to make the best products for baby and mom! 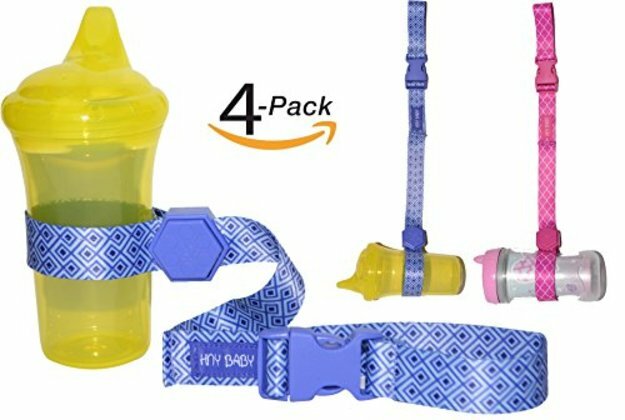 HONEYCOMB PUSH BUTTON - Our unique sippy cup strap locking system makes it easier for you to secure your babies sippy cup or baby bottle to any stroller, highchair or car seat. Forget using velcro that detaches easily, our button lock system ensures your babies bottle or sippy cup stays where it belongs!